HYPER-NATURALISM — New Style in Painting discovered by the artist AME MARI. After many years of study and thousands of experimental paintings with all techniques a painter Ame Mari found a new way of EXPRESSION OF MOVEMENT OF THINKING through PAINTING. 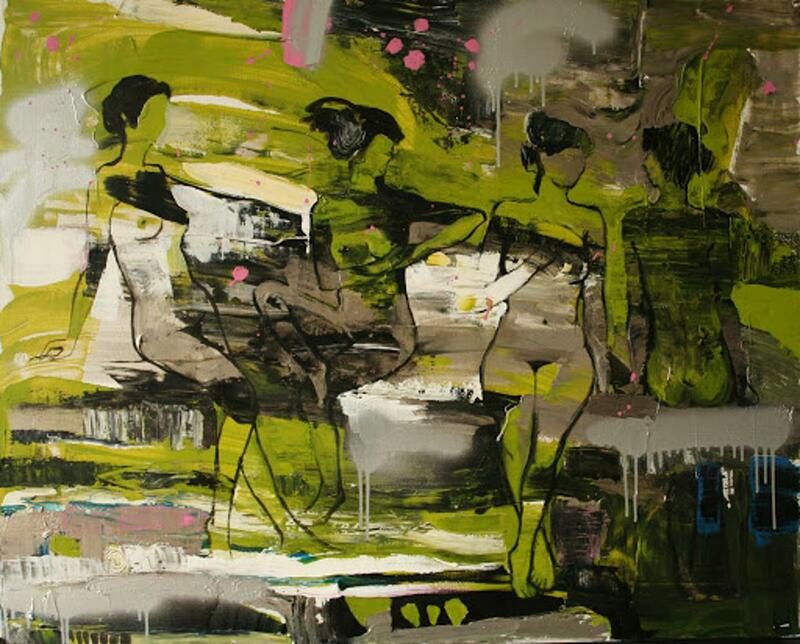 She paints IN MANY LAYERS to express a WIDE-RANGING MIND and AMBIGUITY in all aspects of life. The Artist paints in a MULTI-LAYERED, very difficult manual technique based on ACCIDENT and COINCIDENCE. Every picture of the artist is a kind of MICROWORLD. Compositions of the pictures have no any dominant, points, lines more important than others. They also have neither beginning nor end. Every picture of the artist has its own name like a person has. It is not a title of the picture. It is its NAME. It is important. Because a title suggests a subject. When a picture has been created — in the end — in front of the artist’s eyes — has appeared the first landscape. It is like love at first sight. First time you see something in someone that fascinates you. You see the FIRST LANDSCAPE. But in time — when you look longer at the person-picture, when you feel more — than you start seeing MANY LANDSCAPES IN ONE PERSON-PICTURE. This First Landscape as a Sign of this first moment of the Falling in Love — has given a Name to the picture. The Artist creates NEW LANDSCAPES of NATURE that in fact do not exist but possibly could. It means that Ame does not paint what is seen and observed at the moment. The Artist is not an imitator. Ame neither paints from photos. An Artist is not a copyist. An Artist is a CREATOR. Ame creates — from Her Memory and with Her Imagination — New Landscapes of Nature that could exist but in fact do not exist in reality. AME MARI is an artistic name of ANNA MARIA BIELSKA, born October 7, 1969 in Warsaw, Poland. In 2002 she gained Master’s degree in Architecture with distinction. In 1993 she has got a PRIZE at the biggest Architectural European Competition for designing new art school and campus: FUTURE BAUHAUS in Dessau, Germany. She received her Award at the Exhibition in Düsseldorf. In 2005 she became a doctoral student at the Institute of Philosophy in Warsaw University. Since 1990 she simultaneously designs architecture and paints pictures. In 2010 she abandons architecture for painting and as a Symbol of her New Life she purchases an Egyptian Cat at the international exhibition — the companion on her new way of life… In the end of 2010 AME with her beloved cat AMI starts a long travel. In 2011 she lives with Ami in Barcelona, where her first individual exhibition takes place: TACTOS, she presents 25 pictures from her past, when she was painting figuration and portraits. In 2012 Ame and Ami live in Paris and on the volcanic island Lanzerote. In 2013 they move to Berlin and then to the forest in Magdalenka — 25km from Warsaw, where Ame makes a renovation of her wooden house. In 2014 Ame Mari lives with Ami in Vienna and on the island Sardegna. AME and AMI… — they were everywhere and always together. As a Couple. Unity. And in Sardegna an Italian man murders her great love, her beloved cat AMI. A Symbol and an attribute of her new life. There is a report about the homicide of her love with the tangible proofs like: autopsy in the police station in Olbia in Sardegna. In Europe it is forbidden to kill someone’s domestic beloved animal. According to European Law for such a murder a five years’ imprisonment is sentenced. But most people disregarded her private tragedy. For Ame this murder was an assassination attempt on her New Life. An assassination attempt on her happiness that she created with her great love AMI. After the murder of her great love — the companion in her new life in all travels — Ame experiences a mental breakdown and gets into deep depression. She goes to Spain. Since 2015 Ame Mari lives and works in Canary Islands. «I was wandering hundreds kilometers in many different high mountains. I was exploring many wild sea- sides with several dozen of sand colours. I was walking on the cracked ground after the tremors, with deep ruptures. I was living on the volcanic island. I was also living with my beloved Ami in the forest. In all my life I had an extraordinary contact with NATURE. I feel deep respect and love to Nature, — so only that is why I can — during my act of creation — I am able — to be like nature. To become the NATURE.